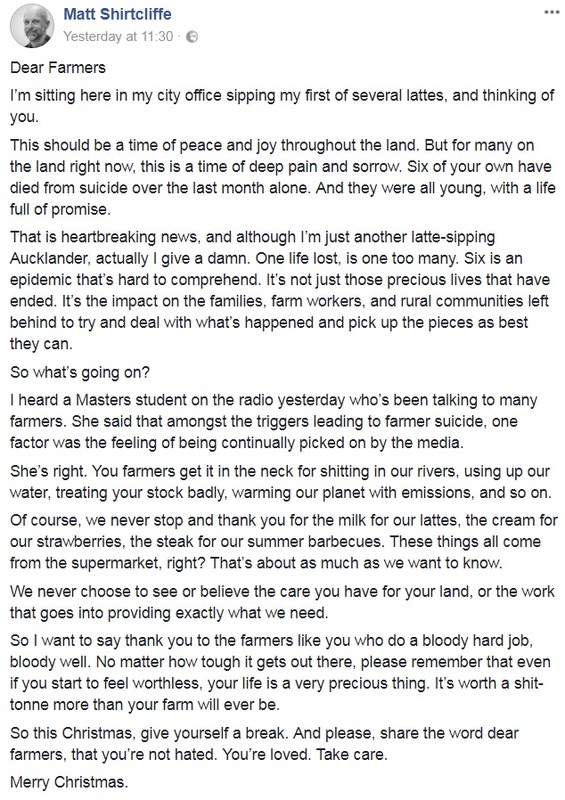 An officer worker has penned a heartfelt message to farmers after learning of high suicide rates in the industry. Matt Shirtcliffe, from Auckland in New Zealand, took to social media yesterday (December 21) and his Facebook post quickly went viral - being shared 2,000 times. His post read: "Dear farmers - I’m sitting here in my city office sipping my first of several lattes, and thinking of you. "This should be a time of peace and joy throughout the land. But for many on the land right now, this is a time of deep pain and sorrow. "Six of your own have died from suicide over the last month alone. And they were all young, with a life full of promise. "That is heartbreaking news, and although I’m just another latte-sipping Aucklander, actually I give a damn. "One life lost, is one too many. Six is an epidemic that’s hard to comprehend. It’s not just those precious lives that have ended. "It’s the impact on the families, farm workers, and rural communities left behind to try and deal with what’s happened and pick up the pieces as best they can. "I heard a Masters student on the radio yesterday who’s been talking to many farmers. She said that amongst the triggers leading to farmer suicide, one factor was the feeling of being continually picked on by the media. "She’s right. You farmers get it in the neck for ’polluting rivers, using up our water, treating your stock badly, warming our planet with emissions, and so on’. "Of course, we never stop and thank you for the milk for our lattes, the cream for our strawberries, the steak for our summer barbecues. "These things all come from the supermarket, right? That’s about as much as we want to know. "We never choose to see or believe the care you have for your land, or the work that goes into providing exactly what we need. 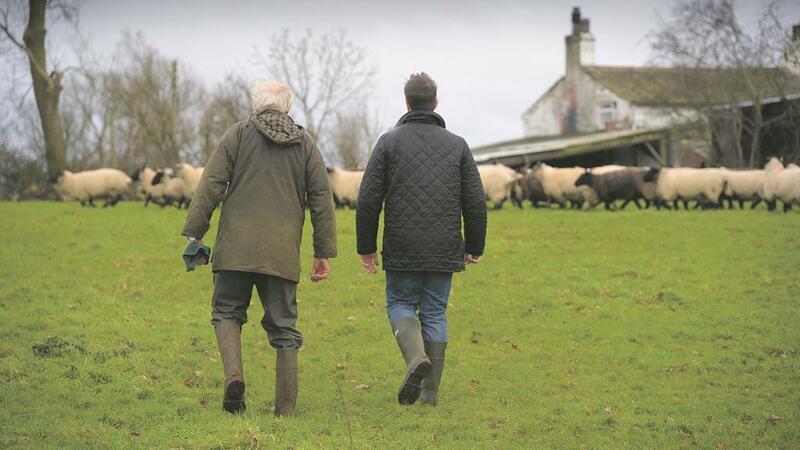 "So I want to say thank you to the farmers like you who do a bloody hard job, bloody well. "No matter how tough it gets out there, please remember that even if you start to feel worthless, your life is a very precious thing. "It’s worth a lot more than your farm will ever be. "So this Christmas, give yourself a break. And please, share the word dear farmers, that you’re not hated. You’re loved. Take care. The post has gone down well with farmers - with many thanking Mr Shirtcliffe for his message. Adrian Wildman wrote: "Thankyou for that Matt. It’s nice to hear from someone like yourself about us farmers and you are right - 99% of us care more for land and animals than those who don’t live on it. "We are blamed for a lot of things but most of the rubbish in our environment comes from other places." And fellow city workers joined in the praise for farmers. Kath Teeboon posted: "Couldn’t agree more! From another latte-sipping Aucklander (who grew up in a rural community) thank you to all the farmers who get up at awful o’clock! 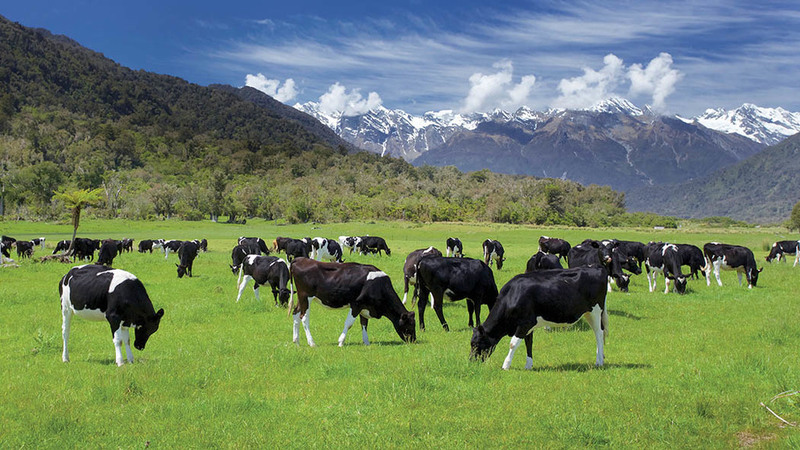 I vastly appreciate all of the dairy products you bring into my life."